Spooky Empire’s Mayhem may have just wrapped, but fans are screaming over the announcement for the Ultimate Horror Weekend. For the first time in Spooky history the event will take place during Halloween weekend, and it’s already kicking off with a huge guest, that could have you SCREAMing…for more. The first guest, of what is sure to be many, has been announced, as well as an all new venue. It’s going to be one hell of a Halloween. Spooky Empire’ Ultimate Horror Weekend has announced their very first guest, a huge date shift, as well as an all new venue. The event will take place on October 30th, through November 1st. Yes, boils and ghouls…that puts it smack dab in the middle of Halloween weekend! It’s the first time ever that the event will be trick or treating, so we expect HUGE things from the demented minds at Spooky Empire. The event will also take place at the Hyatt Regency Orlando, on International Drive. The biggest news, however, is the awesome first guest. 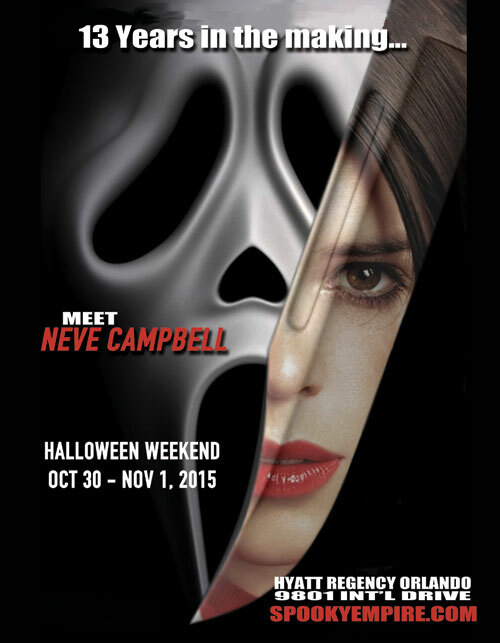 Neve Campbell will be on hand all weekend to sign autographs, take part in Q&A sessions and pose for pictures. Neve is the star of the huge Scream anthology, and it honestly couldn’t come at a better time. The movie is getting the treatment for the small screen, as MTV is launching an all new series. PLUS, there are huge rumors about a Scream house at this year’s Halloween Horror Nights…not confirmed, but still possible. Plus, we know the gang at Spooky Empire…if they’ve announced one cast member from a film or TV series, they usually announce more. It’s very possible that we could get a Scream Reunion of some kind. Plus, if you want to know what kind of fun there is at Spooky Empire, check out the carnage from this year’s Mayhem event, which just wrapped up! Video-Check out highlights from this year’s Mayhem! Just a few weeks ago, Spooky Empire held their annual “Mayhem” event. If you missed it, you missed out on a huge reunion from American Horror Story-Freak Show. The actors got together on stage to answer fan questions, and talk about their experience on the show. The show, however, is much more than just celebrity guests, and panels. There are also loads of costumes, special vendors, artists and terror of all kinds. The event is a chance for horror fans to dress up in their favorite costumes, and get loose. There are tons of special events happening at the show, from burlesque shows, costume contests and even panels about tattoos. It may not seem like it, but the event actually is family friendly, and welcomes little horror fans of all ages. Stay tuned for more Spooky Empire announcements, and be sure to get social with us on Facebook, and follow along with us on Twitter @BehindThrills for the latest updates! For more information about Spooky Empire’s Ultimate Horror Weekend, including tickets and hotel reservations, visit the official website by clicking here!